There are only a few months to grab fresh prime Maine lobster, so make the most of them with this easy but oh-so-fancy Char-Grilled Lobster with Zesty Butter Sauce recipe. This post was sponsored by Grill Mates. As always, the content and thoughts are my own. But they really do make a great seasoning blend. There are a few things as simple as a grilled lobster on warm summer days. Want to have some fun – even if you aren’t an OG Mainer, that is – and join in a debate over the best lobster. And with the tasty zing of Grill Mates Roasted Garlic and Herb Seasoning, you will be able to grill your best all summer long! You can find lobster from all over the country at your local fish counter. Just like many of your favorite ingredients, lobster is a seasonal item so where it was caught varies depending on when you purchase. In early summer, a lot of the lobster are coming from Canada (listen for the accent) but if you have patience, you can hunt out Maine lobster for a premium. Cold water lobster is (arguably) the best, but spiny lobster is caught off the coast of Florida or California. Maine Lobster are caught from the Connecticut coast all the way to Newfoundland and are best are enjoyed in late summer when they have a shed their hard shell. Softshell lobster meat is easier to get to and sweeter. When shopping for a fresh lobster look for long antennas. This means that the lobster hasn’t been in the tank as long. The longer the lobster sits in the tank, the meat to water ratio goes down, as banded lobsters tend to not eat as much. If you are lucky enough, buy directly off the boat in Maine or from a reputable fish market for the best quality. Lobster is a splurge, so might as well go all out for the experience. And if you can’t find lobster – or it isn’t in the budget – this dish is also delicious when made with shrimp! Once you have moved past the region and buying debate, move onto the cooking one. 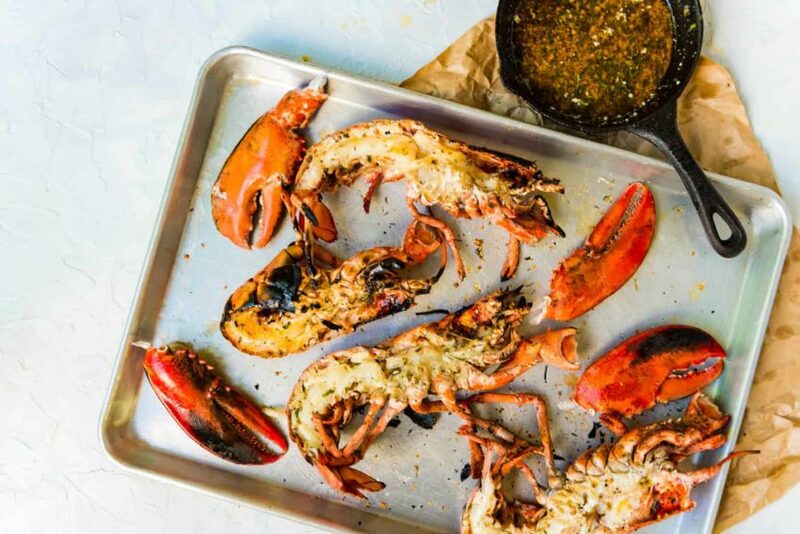 Local Mainer’s will tell you the only way to eat a lobster is to steam them, but this gal disagrees and thinks a char-grilled butter-drenched lobster is just as good. 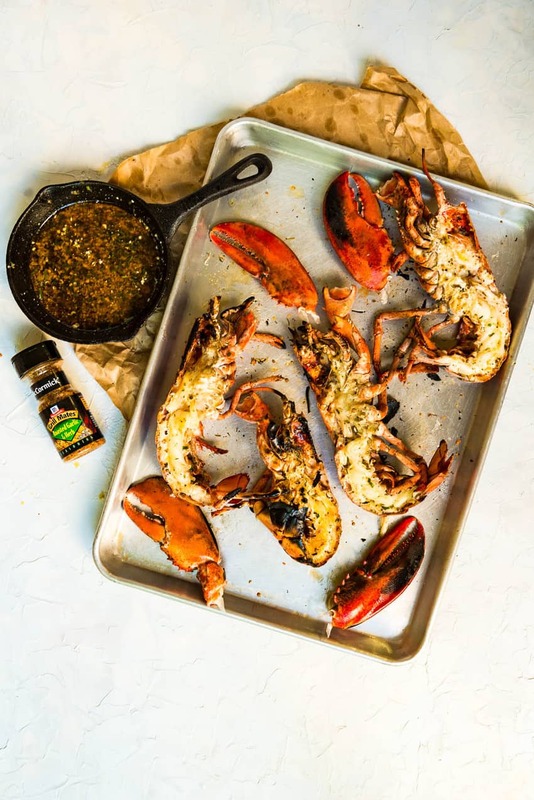 It’s fast and easy to grill lobsters and a quick butter sauce melted with the fun Grill Mates Seasoning Blends makes it almost too simple. Pick your pairing, I debated over the Grill Mates Roasted Garlic and Herb Seasoning or the Grill Mates Chipotle Roasted Garlic Seasoning for a minute or two before settling on the Roasted Garlic for a classy simple meal that would pair well with wine. If you are feeling wild, use both! The flavors would marry nicely together. It was the spiced blended butter sauce that really made this lobster pop. I baste the lobster in the butter once they are flipped for the last few moments and then serve the seasoned butter on the side for extra dipping for the plump claw meat. With fresh charred corn and a salad, this was a simple summer meal that looks like it came from a 5-star restaurant. Minus our messy fingers as we dig right in! Shop for fresh lobster within a few hours of preparing this recipe. Pre-heat your grill for indirect heat by piling your charcoal to one side. Clean and oil your grill grates. Meanwhile, chill the lobster in the freezer for 20 minutes or so before preparing them. Have a clean work surface and a very sharp heavy knife ready. Lay the lobster legs down flat on your work surface. Find the first seam of the shell and press your knife firmly and quickly, splitting the lobster, towards the front. This ensures a quick kill. Then flip and split the lobster tail in half. With a small spoon or your fingers, quickly clean out the tomalley, the organs and other internal items that aren’t meat. 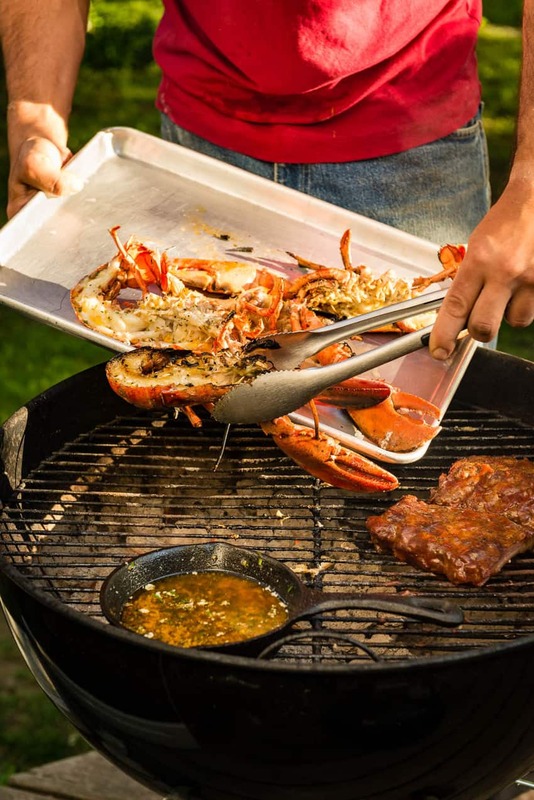 Arrange the lobster on the grill, over the hot side, with the meat down, leaving the shell exposed to air. Cover and cook 2 to 3 minutes. Flip and move towards the cooler side. In a grill safe pan, melt the butter, Grill Mates Roasted Garlic and Herb Seasoning, and chives, stirring to combine. With a heat-safe glove, move to the cool side of the grill to keep the butter liquified. 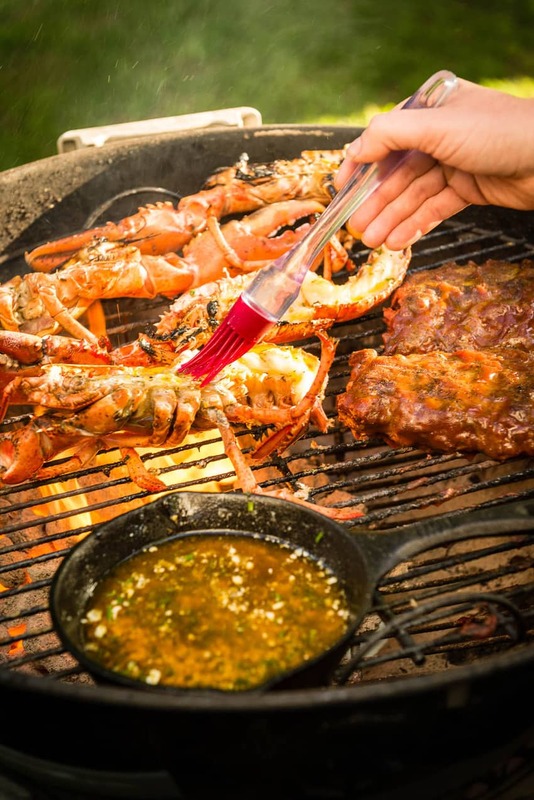 With a grill brush, baste the lobsters repeatedly in the butter sauce as they finish grilling 2 to 5 minutes longer. Remove from grill and arrange on a serving platter. Season with a dash of pepper and fresh chives. Gently break the claws with a soft mallet or seafood cracker. 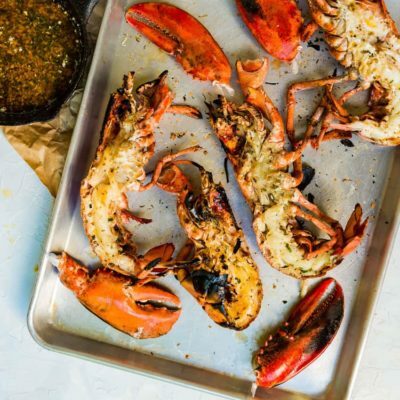 Serve the char-grilled lobster in the shells with small forks and a ramekin of the remaining seasoned butter blend on the side for extra dipping.